Scattered beyond the striking shores of Greece sit thousands of beautiful islands, each with their own unique personality and opportunities for culture, adventure and romance. The ultimate destination for a honeymoon in Europe. The perception of what a honeymoon ‘should’ be has changed. Gone are the days of being satisfied with the ordinary; newlyweds want something more exciting. While there are plenty of popular honeymoon destinations out there, many just offer the same blasé experience of romance mixed with tourist culture. An experience that you could get from any typical vacation. A Greek Island honeymoon, however, offers something far more unique and extraordinary, promising to elevate your escape beyond anything you have experienced before. The Greek Islands are a collection of over two-thousands islands — of which roughly 200 are inhabited —- that surround the Greek mainland. Set like jewels in the mediterranean sea, their lush green hillsides rise above the lapping waves, inviting you ashore. 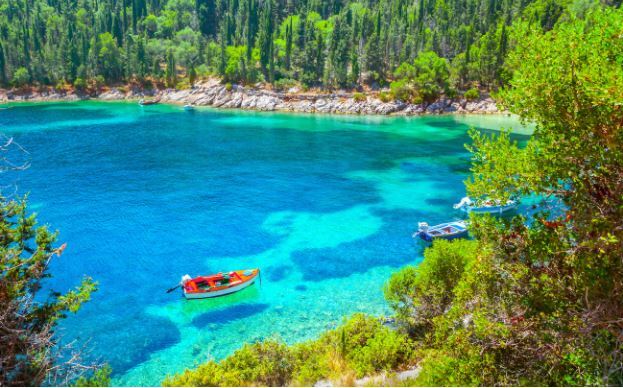 The ultimate adventure to be had while on a Greek Island honeymoon is island hopping, an experience that takes you from one island to another, soaking up everything each has to offer, before jetting off to the next. Why accept only one opportunity for island exploration when you can have several? There are a number of ways to island hop, but none better than chartering a vessel and sailing the Med yourself. Pick and chose your islands, not bound by flight schedules or ferry routes, and travel wherever and whenever you please. Go ashore and visit the highlights of the islands or take the route less travelled and explore uninhabited, desert islands. Wherever your paradise may be, Greek Island hopping can take you there. If you and your new spouse are looking for adventure and excitement, how can it get any better than that? Despite a yearning to discover and explore, sometimes we all just need a bit of R&R. Whether you need somewhere to relax after a long day of adventures, or just feel like taking some time to unwind and do nothing, the Greek Islands have all you need. With a seemingly endless amount of coastline at your disposal, spread over thousands of picturesque islands, there is a perfect spot here for every couple. Want to sit in a beautiful harbour-side cafe? No problem. Fancy sunbathing on a beach all your own? No sweat. Want to lay in a cabana while a waiter delivers cocktails straight to your hand? You get the idea. 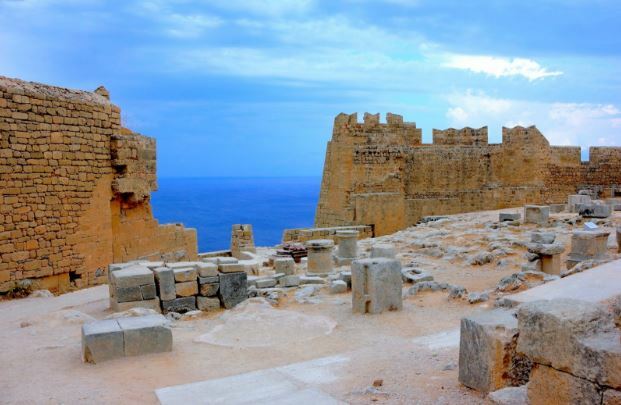 The history of Greece is perhaps one of the longest and most illustrious in the world, and many of the structures that stood thousands of years ago still stand today. The atmosphere of the island’s ancient sites can bring on a sense of awe unlike any other, with ruins varying from magnificent palaces and once flourishing towns, to small and understated village ruins hidden on rustic hillsides. The experience of wandering these peaceful ancient sites — the ruins found on the islands are far less tourist-centric than those on the mainland — is an immersive and wondrous one, propelling you and your partner back in time. Exploring ancient ruins is perfect for couples who enjoy days in the sun, taking in life’s most fascinating details at a slow and relaxed pace. Or simply those who have always longed to see the ancient places of the world. Take a picnic, sit amongst the stones of some coastal ruin and forget about the world beyond this very point. Just the beauty of the islands, and the awe of your location. Modern Greek culture is much more lively than the relics of its past. Vibrant, friendly and boisterous, the personality of the Greek Island residents shines from every corner. Soak up the atmosphere of the colourful streets. noisy markets, beautifully styled architecture and striking displays of art. 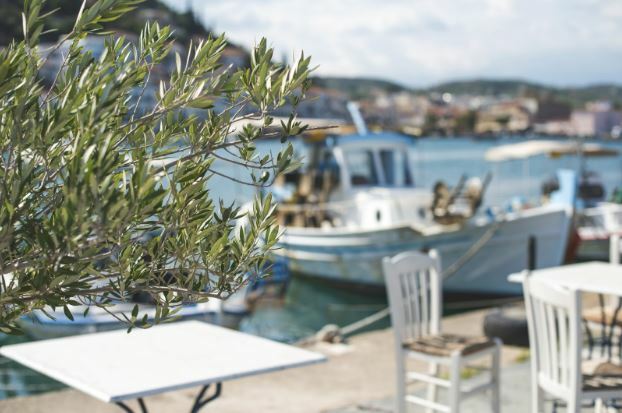 While most island residents share a love of food, wine and good conversation, the rest of your Greek cultural experience will depend on which islands you visit — and which towns within those islands. In large towns, traditional and modern Greek culture tends to come to together. 21st-century ideas of entertainment, food, and art intertwine with classical examples of the very same. Traditional Greek theatre is performed before patrons head off for a wild night in the clubs. Age-old food recipes are given a modern twist by experimental young chefs. Art from classical painters is displayed beside examples by modern artists. These towns are exuberant and exciting, packed with many opportunities for cultural awakenings. When you visit smaller, less frequented islands and villages, the story is very different. This is where you can truly break away from the norm and immerse yourself in a completely unique way of life. Things have changed very little here over the years, and life is simpler, slower and more relaxed. Entertainment often revolves around stories and good, comforting food. Take the time to explore a small village, meet some people and see what life on the Greek Islands is really like. Cultural experiences are a popular choice for honeymooners these days, and with good reason. Exploring and discovering a culture is very memorable, and often unique — a shared experience personal to your relationship. Whatever reasons you base your honeymoon choice around, romance is always going to be a priority. This your opportunity to spend time connecting as a couple, forming lifelong memories that can be cherished forever. The issue with most of the popular honeymoon destinations is just that, their popularity. 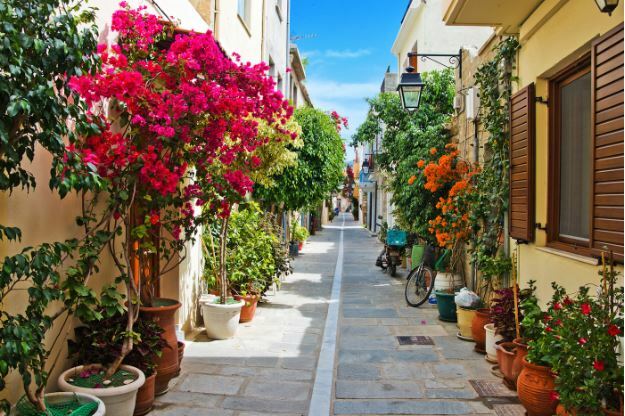 It’s tough to feel the romance of a location you share it with hundreds of other people, yet this is not an issue for newlyweds who decide to take a Greek Island honeymoon. Some Greek Island towns — Corfu, Rhodes, Oia, etc — may be popular destinations for tourists, but you don’t have to go far beyond these places to break away from the crowds, and find a place where you and your new partner can really connect. Open your eyes to this stunning destination, take in authentic Greek life with authentic Greek adventures, and enjoy the perfect honeymoon in Europe. Content by Cliff Blaylock, an expert in all things Greece and owner of luxury yacht holidays company, Deep Blue Yachting.